Mouthwash, along with toothpaste and dental floss, is an integral part of a dental hygiene program. It is great for removing food particles that are left in your mouth even after you brush and floss. It has an edge over toothpaste because it is in liquid form and can reach more the hidden nooks and crannies effectively. Even though mouthwash is not a substitute for toothpaste, it is considered to be great for fighting bad breath and protect against cavities. However, there are quite a few misconceptions about mouthwash that you need to stop believing! Even though mouthwash may temporarily control bad treat, it is by no means a cure. Foul-smelling compounds come from your lungs, so rinsing your mouth will not keep the stink away for long. Your saliva also reduces the effectiveness of mouthwash ingredients by diluting mouthwash. Not all mouthwashes are made equal. Broadly speaking, there are two types of mouthwashes: therapeutic and cosmetic. Cosmetic washes temporarily cure bad breath, remove food particles from your mouth, fight bacteria, and therapeutic rinses may also contain specific ingredients for whitening teeth, strengthening the enamel, and reducing cavities. Additionally, therapeutic mouthwashes may also contain chlorhexidine, essential oils, and cetylpyridinium chloride and fluoride that prevent the appearance of gingivitis and helps reduce plaque. However, long term use of chlorhexidine is discouraged as it may alter your sense of taste temporarily and cause brown spots on your teeth. A lot of mouthwashes contain alcohol and this can be dangerous for children. Alcohol laden mouthwashes can also cause a dry mouth which can be counterproductive as dry mouth irritate oral tissues and is a cause of bad breath. Alcohol can also increase the sensitivity of teeth. Even though alcohol-free mouthwashes are also available in the market, some other ingredients can cause side effects too. Some may even cause a burning sensation or stain your teeth. You need to swish your mouthwash for at least 30 seconds around our mouth to let it do its job effectively. Since most mouthwashes are strong and cause a stinging sensation, a lot of people can’t handle them for that long. However, for best results, you must use mouthwash according to the instructions given on the package. Even though mouthwash fight bacteria in your mouth, you still need to brush and floss your teeth to remove debris and plaque. 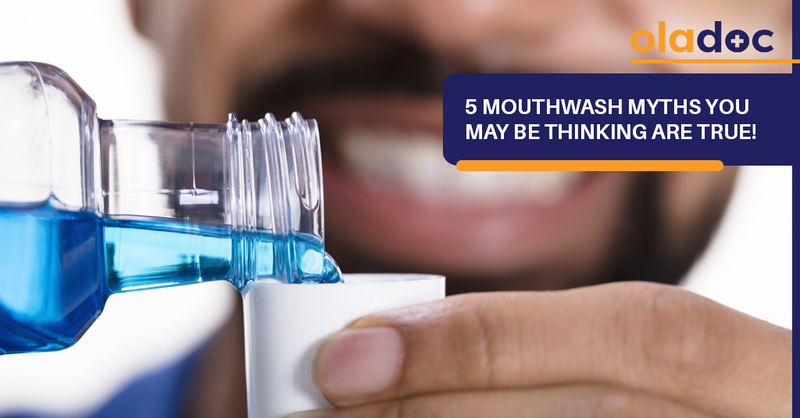 Mouthwash isn’t as effective for maintaining oral hygiene on its own. Look at mouthwash as an add-on that can fight gum inflammation and contribute to the overall cleanliness of your mouth. You should visit a dentist if you have dental or oral hygiene issues. You can find and book an appointment with top dentists in Lahore, Karachi, and Islamabad through oladoc.com. You can also call our helpline at 042-3890-0939 for assistance to find the RIGHT Doctor for your health concerns.